On the afternoon of Jan. 3, 1871, a ship’s carpenter marooned with 87 others on a desert island at Kure Atoll in the Pacific saw a smudge of smoke on the horizon, the first sign that five valiant men who had set sail from the atoll 46 days earlier on a jury-rigged 30-foot whaleboat had found help. Joyous as the moment was, what the carpenter — a Mr. Mitchell — could not know until the Hawaiian steamer Kilaueau put a search party ashore was that four of his five messmates who had volunteered for the desperate mission to look for help had died when their boat capsized in the surf off the Hawaiian island of Kauai. The men had endured three gale-force Pacific storms with winds exceeding 41 knots, waves of more than 18 feet, and 1,500 miles at sea in a small boat, but their quarter rations had spoiled, leaving them weak, sick and near starvation. In the end, the sea took four of them. 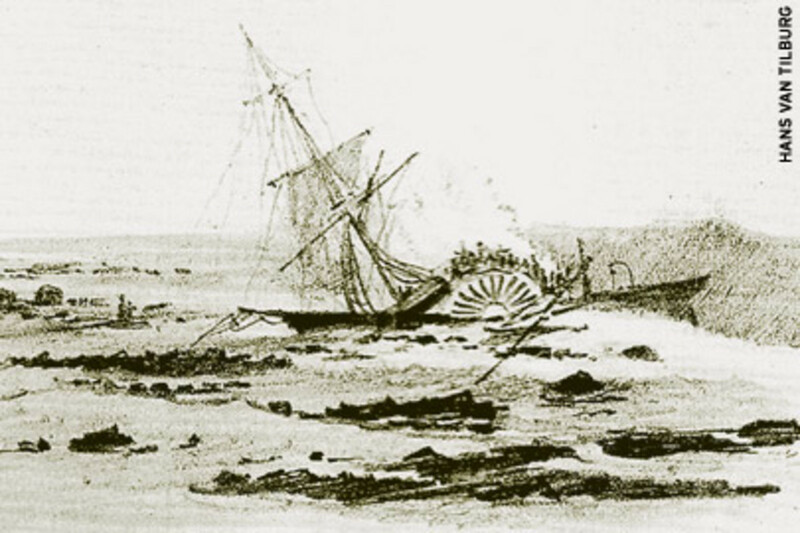 The sole survivor swam to shore and caught a schooner to Honolulu, where Hawaiian King Kamehameha V dispatched his steamer to rescue the marooned sailors on Kure. Those 87 lived because of their shipmates’ bravery. 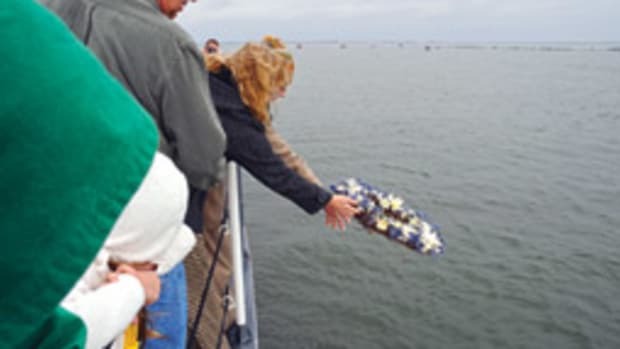 The wreck of the USS Saginaw and the saga of its crew’s rescue was widely reported at the time — like the emergency landing of US Airways Flight 1549 in the Hudson River 138 years later — as a story of great heroism in extremis. Saginaw’s crew had been marooned on a patch of coral that was about as far from anywhere as it could be. The atoll — a ring of coral encircling a lagoon and an island a mile long, a half-mile wide, and no more than 20 feet high — is the northwesternmost of the islands stretching from Hawaii to Midway. It is 1,700 miles from the Aleutians, 3,200 miles from Los Angeles, 2,400 miles from Japan, and 1,500 miles from Oahu. The rescue mission survivor, Coxswain William Halford, was awarded the Medal of Honor. All five who volunteered for the voyage are immortalized on a marble tablet that Saginaw’s crew gave the U.S. Naval Academy. The crew also brought the whaleboat — actually a captain’s gig converted to a sailboat — back with them to San Francisco, though its masts were lost in the breakers. It, too, went to the academy as a reminder of their shipmates’ heroism. Now it is at the Historical Society of Saginaw County’s Castle Museum in Saginaw, Mich. The story of the Saginaw, a 155-foot sidewheel steamer, has come into sharper focus during the last few years. Through NOAA archaeological expeditions in 2003, 2006 and 2008, the wreckage was found at the atoll in what is now part of the Papaha-naumokuakea Marine National Monument, the largest protected area under the U.S. flag, stretching the length of the northwestern Hawaiian Islands. “Kure is the most remote atoll in the Pacific,” says Hans Van Tilburg, maritime heritage coordinator for NOAA’s Office of National Marine Sanctuaries and an expedition organizer. 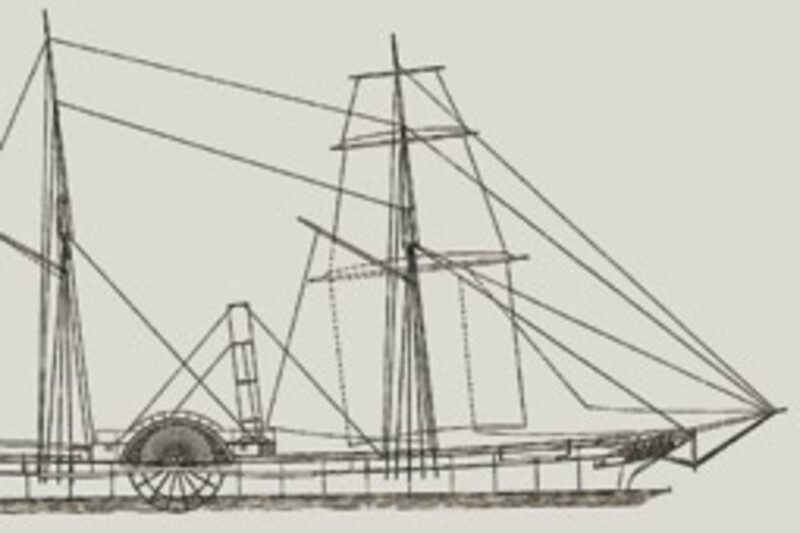 The Saginaw was a sailing sloop with two paddlewheels and a pair of steam engines — a hybrid designed for the transition from sail to steam. She was the first ship built at the Navy’s first Pacific Coast shipyard, Mare Island, near Vallejo, Calif. She was launched 150 years ago, in 1859. “The Saginaw had a fascinating history of Naval service in the Pacific, Latin America and China,” Van Tilburg says. As a gunboat in the U.S. Navy’s East India Squadron, she patrolled the China coast while suppressing pirates and protecting American shipping, according to the Naval Historical Center. Saginaw served in the Civil War guarding shipping routes between Panama and San Francisco from Confederate raiders like the SS Shenandoah. She also spent time in Puget Sound checking out reports of Southern privateers fitting out in British Columbia. 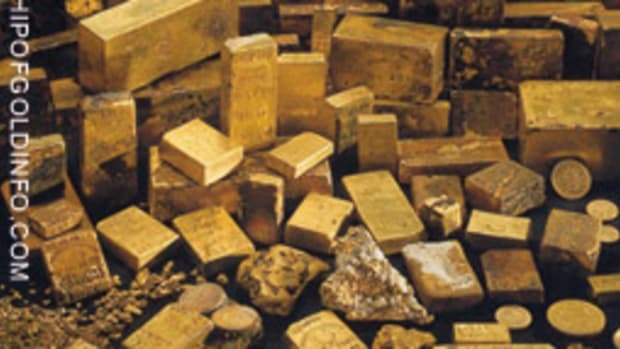 After the war, Saginaw escorted ships carrying bullion from the California gold fields, and steamed to Mexico and Central America to protect American interests during the French occupation of Mexico. 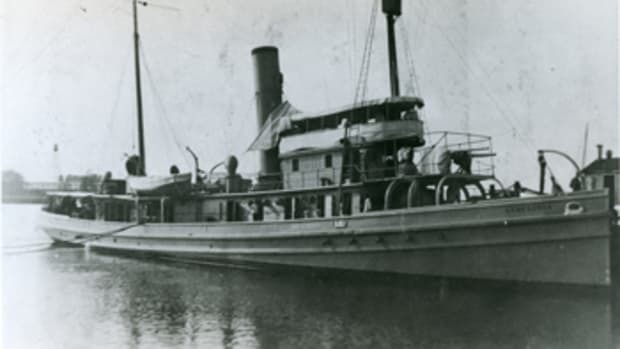 She assisted the Western Union Company in laying cable in the Pacific Northwest and charted Alaska waters for a year. In 1871, the Navy dispatched the wood-hulled steamer to Midway Island with a crew of hardhat divers contracted to blast a 175-foot-wide channel through the coral and into the lagoon so the Pacific Mail Co. could build a coal depot there for its steamships running back and forth to the Orient. “They took 17 contractors — divers — who were supposed to blow a hole in the reef big enough for ships to go into the island,” says Paul Nitchman, of Torrance, Calif., an amateur naval historian, author of a dictionary of 1,400 biographies of namesakes of Navy ships, and an authority on the Saginaw saga. Saginaw, commanded by Lt. Cmdr. Montgomery Sicard, headed 50 miles west to Kure first to check the island for castaways, as mariners did in those times when they navigated remote waters. “[Sicard] knew where the atoll was. He took all the necessary precautions,” Nitchman says. However, these Pacific waters hadn’t been well-surveyed, especially for currents. A Navy court of inquiry convened in San Francisco after the crew’s return found that “the wrecking of the Saginaw was caused by a current, as the evidence shows care in running the vessel at a safe rate of speed and the log line [for measuring ship speed] was found to be correct. … Sicard used due vigilance and care in the navigation of his vessel.” But he evidently miscalculated the strength of the current. The Saginaw was making about 3 knots under sail on a dark night, its crew expecting to sight Kure at first light, according to George H. Read, paymaster on Saginaw, one of the shipwreck survivors and author of a book, “Last Cruise of the Saginaw,” published in 1912 — 42 years after the grounding — by Houghton Mifflin Company. Read retired at 10 o’clock that first night at sea only to awaken around 3 a.m. to “an unusual commotion on deck,” he wrote. The lookout had sighted the white sheen of breakers. The captain ordered his crew to douse the sails and reverse the engines. Climbing up the ward room ladder, Read felt a shudder run through the ship, then two more that “caused the ship to tremble in every timber,” he writes. Saginaw had run up on the east side of Kure’s reef. Sicard had ordered the engineers to reverse the engines, but the fires in Saginaw’s boilers were bunkered — just ash and hot coals. They couldn’t build up a head of steam fast enough to avoid the reef. Within 20 minutes the hull was holed, water was pouring into the ship, and its coal fires were doused. There was no chance of powering off the reef, Nitchman says. The crew tried to lower Saginaw’s launch — her biggest boat — into the foaming sea, but a wave tore it loose, smashed it against the side of the ship, and carried it off. That same wave swept one of the Marine guards off the bulwarks, dragged him seaward, then returned him to the stern, where the crew heard his cries and dragged him back aboard. In the stiffening wind, the breakers crashed harder onto the reef, turning the ship around so its bow now pointed seaward. She rocked back and forth on the reef’s crest until the bow broke off and slipped down the outer wall of the reef and into the ocean depths. The aft section, heeled over on the calmer cup-shaped inner reef, had by now lost its mast and smokestack. 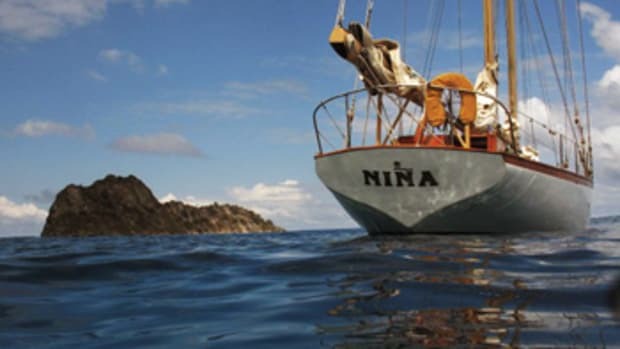 The crew gathered there, and as dawn broke they began to salvage all the supplies and provisions they could for transfer to three small boats — the captain’s gig, a tiny sailboat and a dinghy. “A line was formed across the reef, and everything rescued was passed over the side and from hand to hand to the boats in the lagoon, for transfer to the island,” Read writes in his book. “Thus, we stood waist-deep in the water, feet and ankles lacerated and bleeding, stumbling about the sharp and uneven coral rock until five in the afternoon. Miraculously, no one had lost his life in the nighttime grounding. Green Island, a spit of scrub-covered sand with no trees for shade, was the only habitable island in the atoll. Read writes that the crew found colonies of monk seals and goony birds (brown albatross), and those — along with fish and sea turtles — put meat on the table. The castaways would hunt the seals and birds with clubs instead of rifles so they wouldn’t scare them off. The goonies were judged “tough and fishy,” but tastier by far than seal, which was too tough to chew. 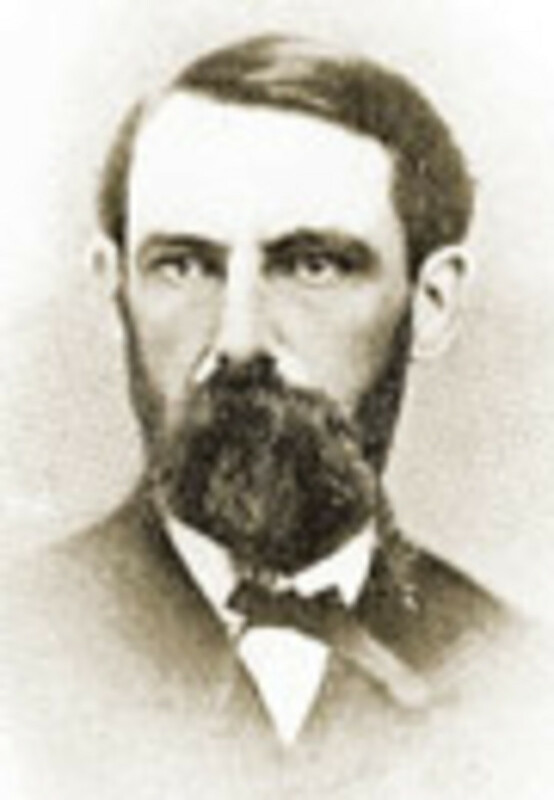 Under Sicard’s direction, Saginaw’s men salvaged a boiler and copper coils from the wreck to distill fresh water from sea water. Later, while digging a hole for a lookout tower, they tapped into an underground reservoir of fresh water. Food was rationed to a quarter of what the crew usually ate. Rats had overrun the island and routinely raided the stores tent, where the crew kept the coffee, hardtack, flour, macaroni, dried beans and potatoes, salted pork and mutton they salvaged from the Saginaw. Anticipating the worst case, the castaways were under strict orders not to kill the vermin in the event the goonies and seals deserted Green Island and they had to eat rat meat. “I always think of this story when I see the TV show ‘Survivor,’ ” says Sandy Schwan, chief curator at the Castle Museum, where the gig is now. The marooned crew couldn’t be content to just sit and wait for a ship to find them. Sicard instead sent out a small-boat party to find help. His crew, which included shipwrights, rebuilt the captain’s gig — an open, shallow-draft rowing whaleboat — adding 18 inches of freeboard, two masts fitted with salvaged sails, and a light canvas-covered deck with three hatches and a fourth cockpit hatch with kayak-type skirt for the helmsman. “It was not a large boat. 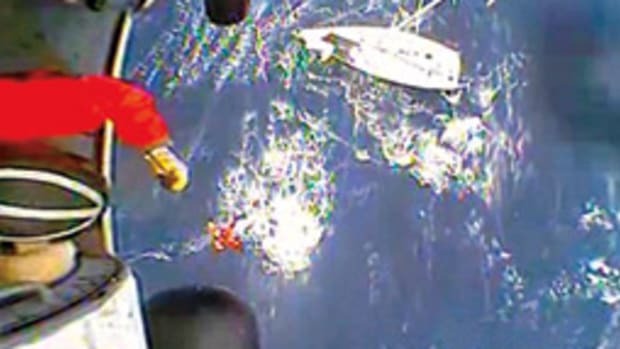 It was the captain’s boat, not much bigger than a large lifeboat,” says Schwan. 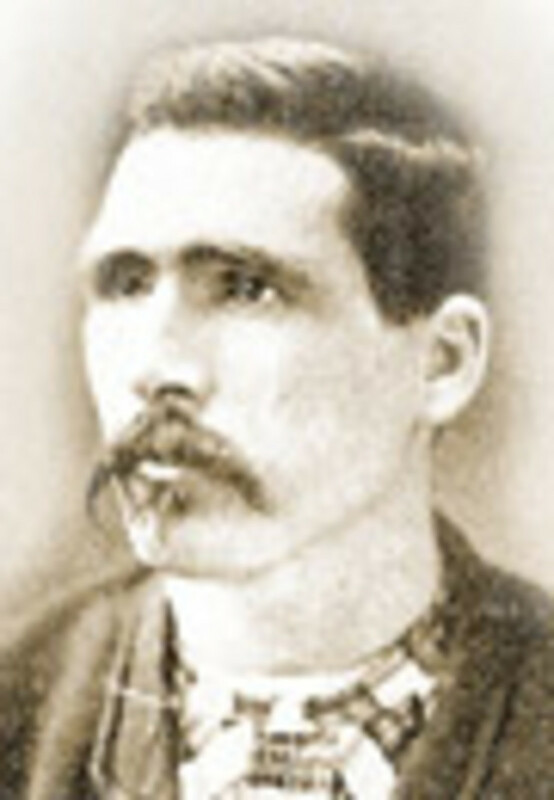 Lt. John G. Talbot, Saginaw’s 26-year-old executive officer, volunteered to lead the party. 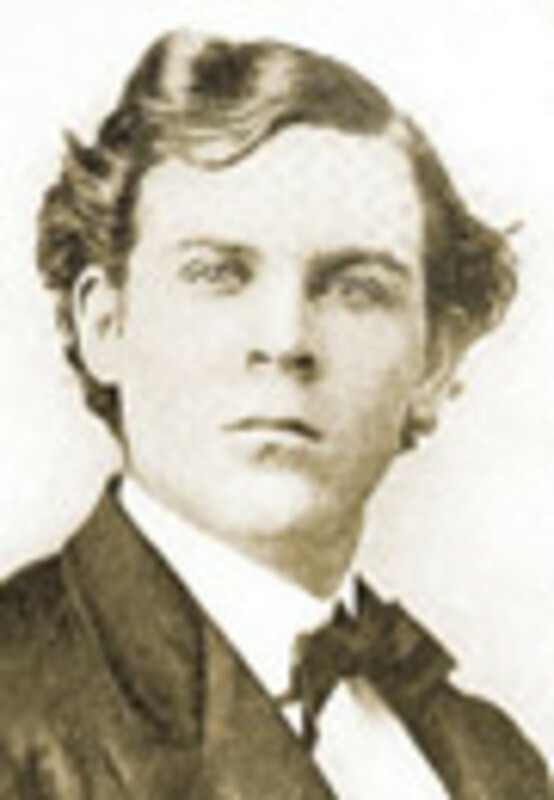 An 1866 graduate of the Naval Academy, the Kentucky-born Talbot had been promoted to lieutenant the previous March. Read writes that many volunteered to go with Talbot. The ship’s surgeon chose the four who were most fit for the 1,500-mile voyage to Honolulu. Talbot’s crew were Navy Coxswain William Halford, a 29-year-old from Gloucester, England, who had been in the Navy just a year and the lone survivor of the rescue party; Navy quartermaster Peter Francis; and two of the contractor’s crew, John Andrews and James Muir, who were inducted into the Navy for 30 days to go on the mission. Using the ship’s steam gauge, shards of mirror and scraps of zinc, Herschel Main, one of Saginaw’s second assistant engineers, fashioned a sextant for Talbot to use on the voyage. An officer drew up a copy of the nautical chart for that part of the Pacific and copied all of the Nautical Almanac tables necessary for navigating. Read collected the stores for the voyage — a keg of water, hardtack, salted meat, dried potatoes, cooked beans, boiled grits, a ham, preserved oysters, lima beans, butter, a gallon of molasses, 12 pounds of sugar, tea, coffee — which was 35 days of half-rations for the crew, as well as a sperm-oil-fired cooker. Even before the gig sailed, the castaways had dismembered as much of the Saginaw as they could, bringing wood and nails and masts and sails ashore to build a 40-foot schooner — flat-bottomed with a centerboard — in case the small-boat crew perished and no help came. From interviews with Halford, Read was able to piece together the story of the rescue party’s difficult voyage. Talbot was to sail north to latitude 32 degrees, pick up the Pacific westerlies, sail east to the longitude for Oahu, then south on the trades to Honolulu. As it turned out, Talbot turned south too soon, taking them well west of Honolulu and lengthening their time at sea. They lost their cooking stove five days into the 31-day voyage and soon discovered that much of their food was spoiled, either before it was brought aboard or soon after when it became soaked with seawater because of a leaky deck. The crew had to bail at least once a day to keep the boat seaworthy. Nitchman says four of the crewmen ate spoiled beans early on, and the dysentery that resulted dogged them for most of the voyage. Halford, suspecting the beans had gone bad when he heard gas spew from the can during opening, contented himself with eating dried potatoes moistened with sperm oil, saving him from the debilitating dysentery and maybe saving his life. 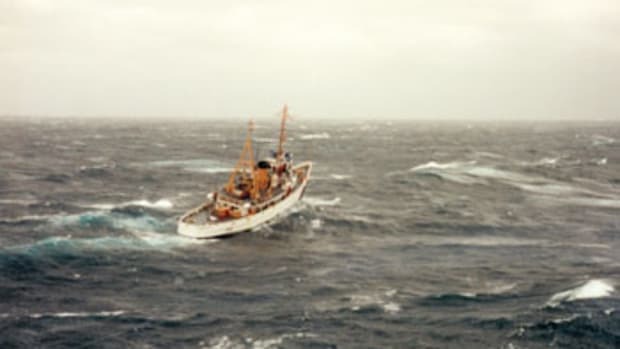 The crew hove-to twice in heavy weather while sailing east, and the second time they lost their sea anchor. They improvised one with three oars, which they also lost, then fashioned another from two crossed oars and a patch of sail, which survived three more bouts of bad weather before breaking apart. One bright moonlit night, Halford had just taken the helm from Francis, who then crawled forward on deck and somehow fell overboard. 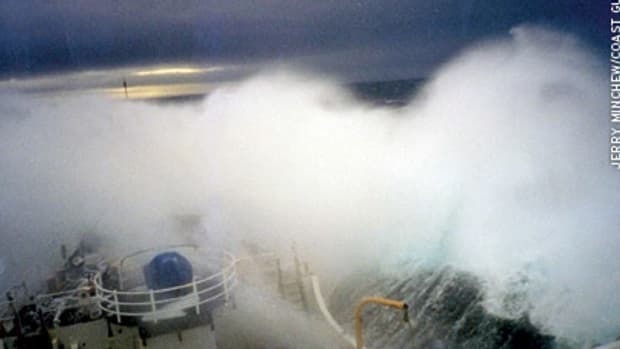 “Luckily we had a strong fishing line trailing astern all the voyage but never got as much as a bite until it caught Francis, and we got him on board again,” Halford told Read. On Dec. 16, the morning after their flying fish dinner, the crew sighted Kawaihua Rock at the south end of Nihauu Island, 18 miles southwest of Kauai. Winds were unfavorable as they made their way to Kauai, so it wasn’t until about 11 o’clock on the night of Dec. 18 that they sighted the entrance to Halilea Harbor. Talbot gave orders to steer for the harbor entrance but to keep a distance from it until first light, when they would try to make landfall. They hove-to several times, but Nitchman says they kept drifting down the beach until suddenly they were in the surf. A wave broke over the stern. Talbot ordered his crew to bring the boat into the wind, but it was too late. Another wave broke over the boat, and she capsized. 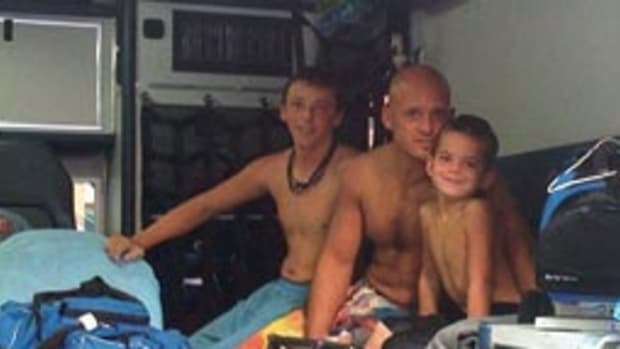 “Andrews and Francis were washed away and were never afterwards seen,” Halford said. “Muir was still below and did not get clear until the boat was righted,” and then he was delirious and incoherent. Meanwhile, Talbot was clinging to the side of the upturned boat. Halford yelled for him to climb onto the bottom, but as he struggled to get up a wave washed him away and he sank. “He made no cry,” Halford said. Halford stripped down and climbed onto the upturned hull, only to be thrown off when another breaker righted the boat. Muir, who still was below, stuck his head out of a hatch, but another wave pounded the gig, rolling it twice more with Muir inside before it righted yet again and rode in toward the beach on the breakers. Halford held on to the boat and went in with her, finally wading ashore in chest-high water. It was about 3 a.m. when an exhausted Halford stepped onto land. 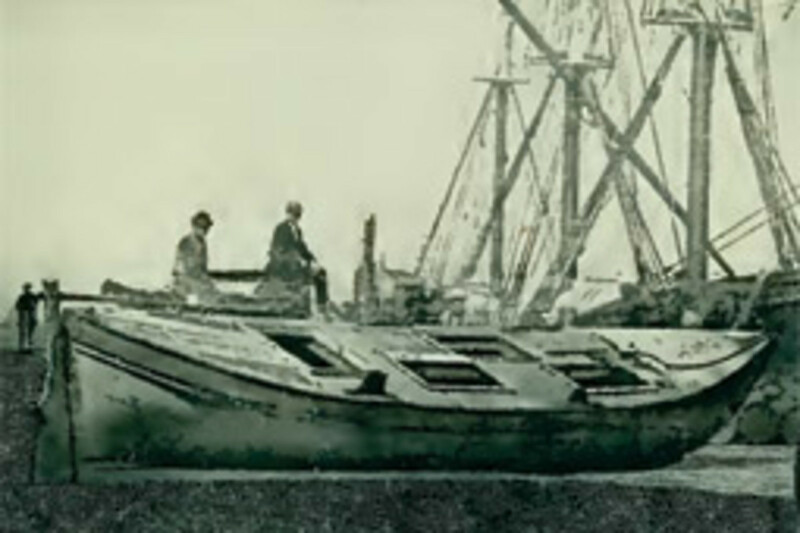 The gig, recovered from the surf and shipped to Honolulu with Halford, went with Saginaw’s crew to San Francisco, where it was sold at auction as military surplus. Read writes that a syndicate of friends of the Saginaw placed the winning bid and turned the gig over to the ship’s crew, who donated it to the Naval Academy. 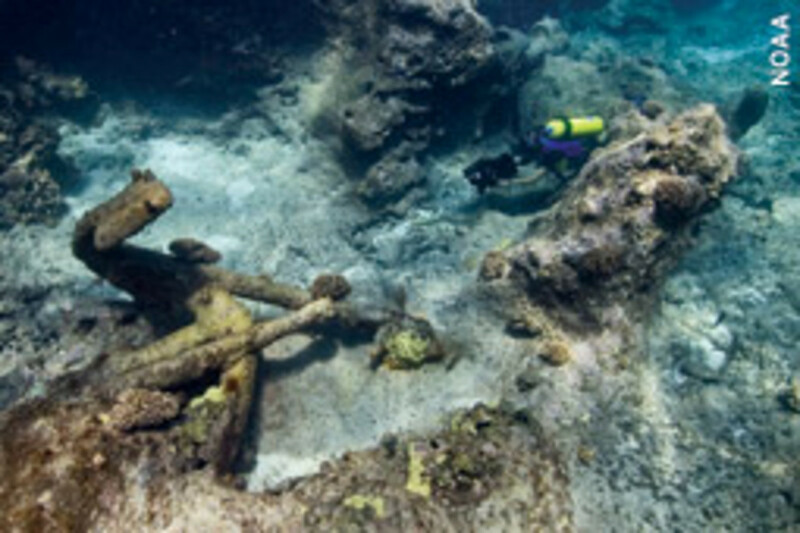 Van Tilburg, the historian, says his expedition recovered a ship’s bell and sounding lead from the shipwreck site that eventually will be part of a display at the Northwestern Hawaiian Islands Coral Reef Ecosystem Reserve Discovery Center in Hilo on the island of Hawaii. Halford, awarded the Medal of Honor Feb. 8, 1872, was promoted to the rank of gunner, then chief gunner, and in July 1918 to lieutenant. He died a year later. The World War II destroyer USS Halford was named for him. Saginaw’s captain and executive officer were namesakes for the World War I destroyer USS Sicard and 1897 torpedo boat USS Talbot.